Mahal ko na si Bono | Sunny Side Up! « Bb. Pilipinas brouhaha. kebs. ..You see, at the center of all religions is the idea of Karma. You know, what you put out comes back to you: an eye for an eye, a tooth for a tooth, or in physics—in physical laws—every action is met by an equal or an opposite one. It’s clear to me that Karma is at the very heart of the universe. I’m absolutely sure of it. And yet, along comes this idea called Grace to upend all that “as you reap, so you will sow” stuff. Grace defies reason and logic. Love interrupts, if you like, the consequences of your actions, which in my case is very good news indeed, because I’ve done a lot of stupid stuff. …The point of the death of Christ is that Christ took on the sins of the world, so that what we put out did not come back to us, and that our sinful nature does not reap the obvious death. That’s the point. It should keep us humbled… . It’s not our own good works that get us through the gates of heaven…. Kudos for his courage to speak about Jesus and his faith while setting aside probable discontent from some readers. Just an update for U2’s rumored concert here in Manila, I read from Inquirer that MTV Philippines and Smart are still negotiating with the Irish band although nothing is still definite. Yeeeeees! So the rumors do have basis! I’m willing to scrape my savings just to see them perform a few feet away from me. 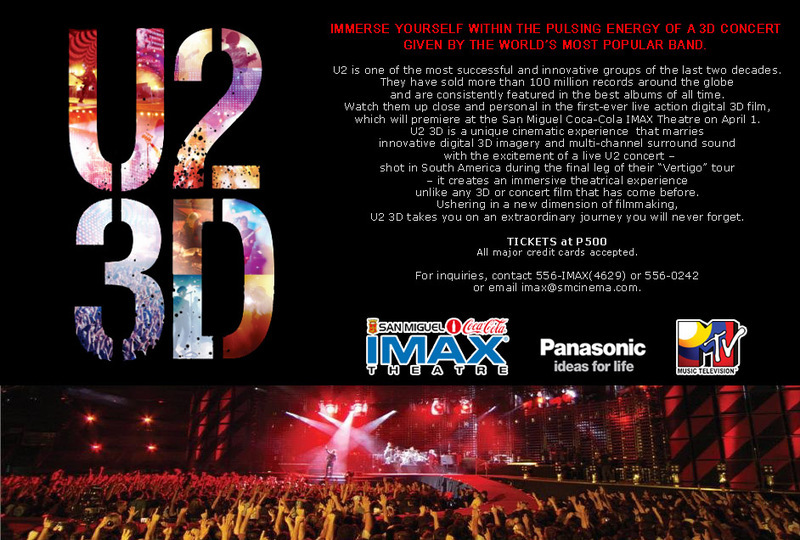 watched u2 3d sa IMAX. super sulit ang 500pesos! sana nasa Pinas ako by the time na magconcert ang u2 diyan.